Our clients can avail from us, a wide range of World Clocks that are highly fascinating as a decorative. Ideal for antique collectors, these world clocks are crafted to perfection by our expert team of creative spurs. Available in different frames and dials, these clocks are offered to our clients in most competitive prices. We bring forth for our clients an attractive gamut of Antique Victorian Pocket Watches. These products are manufactured using optimum-grade material under the strict surveillance of qualified professionals. Latest machines and equipment are employed in the manufacturing process following industry norms & standards. 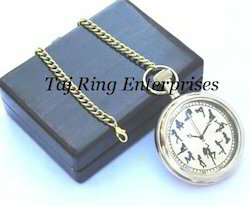 This is Beautiful Nautical Antique Pocket Watch With Brass Chain. This Pocket Watch Engraved With Back side with awesome design. Antique nautical Pocket watch With Nautical Replica theme collection. This nautical pocket u gift for any person. This clock dia is 2inch. All Work is hand made. 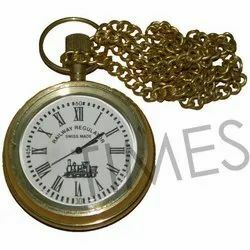 To meet the diverse demands of our valued clients, we are offering a wide range of Brass Made Pocket Watch. These watches are light weight and convenient to carry. These Brass Made Pocket Watches offered by us can also be customized according to the specific requirements of our clients.